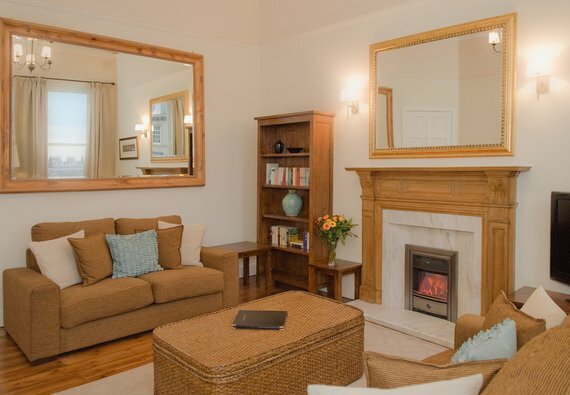 The homely living room, with sumptuous sofas and decorative fireplace, is the ideal spot for relaxing after a long day exploring in the nearby National Gallery of Modern Art, or shopping up a storm along George Street. Freeview TV and unlimited WiFi provide entertainment, or you could enjoy the marvellous city view, provided by large windows. The super-sleek, contemporary kitchen is on hand to assist with any culinary desires, and fully fitted with all mod cons including dishwasher and washer/dryer. When it’s time to hit the hay, the kingsize master bedroom enjoys garden views, and the second benefits from twin beds. A modern family bathroom with shower over bath completes this delightful home from home. Lynedoch Place combines an excellent central location within the heart of Edinburgh's West End in an elegant residential street that exemplifies the New Town grand design. The property enjoys all the benefits of city centre living and the local area is awash with galleries, boutiques and delicious patisseries. The New Town and Stockbridge are just a few minutes’ stroll away, and our infamous Medieval Old Town, home to Edinburgh Castle and The Royal Mile, is also just a haggis’ throw away at one mile or 20 minute walk. This property is perfectly situated for both city centre exploration, and easy access to the rest of Edinburgh, Scotland and beyond. The main tourist attractions are within walking distance, and frequent public transport routes to other areas of the city pass through Shandwick Place, just around the corner, including Edinburgh’s famous new Tram and the Airlink airport bus. Haymarket railway station is also a short walk away, and Waverley station is a 5 minute taxi journey away. Edinburgh Zoo, Murrayfield Stadium and Murrayfield Ice Rink are a short drive or bus journey away. No reviews yet for The Lynedoch Place Residence.